lets Enjoy Dinner in the Sky comes under the top 10 most unique dining experiences around the world. According to Forbes Magazine, it is one of the world’s most amazing place for extravagant meals. Dive into a mesmerizing experience of fine dining among the clouds while enjoying the panoramic view of Palm Jumeirah, Dubai Marina, Burj Al Arab, Burj Khalifa, etc. Indulge yourself in one-of a-kind unique dining experience from 50 meters in the sky. 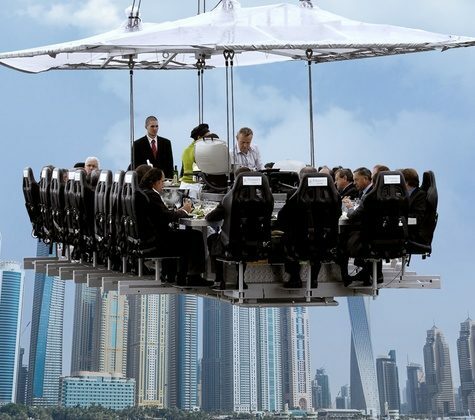 Now get the opportunity to create a memorable dining experience while floating in the sky at 40 iconic locations across the world including the Marina if Dubai, Athens, Cape Town, Copacabana Beach, Kuala Lumpur Tower and many more. For bookings, please call or Whatsapp: +971505880766 or +971588866923 or send an email to info@dxbsafari.com with your voucher code, name, contact details and desired date and time. Till 14th of May 2019, Dining in the Sky will host 6 sessions daily. Duration of each session is 90 minutes. While in the following step of the ticket booking process, you must choose the option from the three menus which are spread across six slots. Kindly select the option that suits you the best. We are advising you to arrive at the place at least 45 minutes prior to your scheduled time of meal. The reason behind that is you should not miss the welcome drink and most importantly the safety briefing. A point to remember if you miss the safety briefing, you are not allowed on the experience. The maximum group size of Dining in The Sky is 22 people. Wear whatever you want. Nevertheless, we will recommend you carry a light windcheater in case you feel cold in the sky. Change of menu and dietary restrictions are allowed only if you are going in a large group, otherwise you can’t change as per your wish. The minimum age requirement for participation in this dining experience is 8 years. Kindly note the fact that if the height of the child is at least 135 cm then they are allowed. No changes in the menu and the pricing will be there. Facilities are provided to the disabled guests with wheelchairs. However, prior information and explanation is highly appreciated. It is highly recommended that use the restroom before you take your seat. Platform will be lowered in emergency situations. However, you can not continue this session repeatedly. As per the safety norms, smoking is not allowed while you are availing the experience. Dining in the Sky guarantee safety for you. It is strictly operating under the guidelines of the Department of Occupational Safety & Health and Civil Defense in UAE. After booking, your voucher will be emailed to you within 20 minutes of purchase. Please display the voucher on your mobile phone with your valid photo ID. © Desert Safari Dubai – Tours and Deals 2019. All rights reserved.